← You’ve heard of having a Chili Cook-off? Well, how about a CHILLY KICK-OFF?! 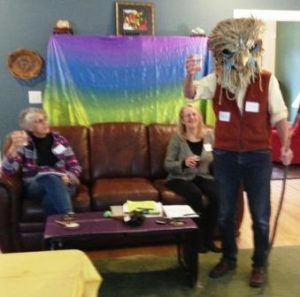 T he New Year’s Planning Party on January 13th lived up to its name, with music, dancing, food, fascinating conversation — and a solid path for getting to groundbreaking! 2019 is THE YEAR for Hart’s Mill to pull all the pieces together towards building the integrated Ecovillage of our dreams. Plans for the community farm are well underway, forest stewardship (the Wood Wide Web) has begun, and now we’re blazing to build the village in 2020. There’s so much to be grateful for and appreciate right now, and we opened the afternoon by filling glasses with sparkling beverages to toast our achievements to-date: the wonderful people who have come together, the beauty and abundance of the land, and the critical accomplishments that have gotten us to this launching point. Hart’s Mill is a vibrant community already, and it was wonderful to acknowledge the many ways in which we have already made a positive difference in lives and lands. 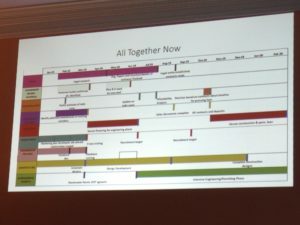 The timeline lays out an ambitious and optimistic (but not delusional) path focused on getting to groundbreaking. Katy Ansardi and others worked tirelessly with Allie to identify key benchmarks aligned across several project elements that will guide us through the year. It’s a great education in Ecovillage development to see all that must be accomplished compressed on a single page! As for how we get there, each Circle has been working hard to identify what they can achieve to reach these goals. 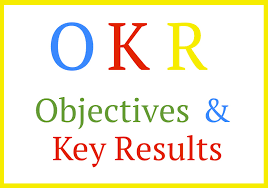 Circle leaders presented OKRs for the first quarter that correspond with the master timeline. A rich round of thanks goes to Allie and all who devoted their hearts and minds to forging–and to walking–this path. It was time to take it all in and reflect on how each of us could fit into this picture. What will Hart’s Mill look like/feel like in 5 years? What will we be doing? How will we be living when we are on the land, together? It was a rich experience to go inside and visualize what Hart’s Mill has meant to us, explore the joys and challenges, and envision our lives based on the many Principles and Intentions that have moved us thus far. After sharing with each other what we discovered, we all had an opportunity to explore what we can do during the first quarter to move this process along. What is each of us passionate about; what are our skills; what brings us energy; what would we gladly do to realize this vision? Participants translated their dedication into action, creating personal OKRs with specific offerings. It was wonderful to harness and receive such generous promises of time and talent. And now….let’s celebrate! Turn up the music, clear the dance floor, enjoy the food and libations, and mostly–have fun with each other! 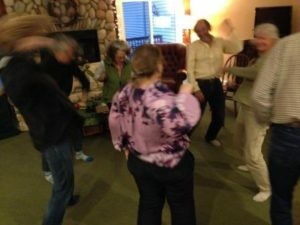 It was a great way to energize all that we have become, all that we are, and all that we will create to make this corner of the world more beautiful, more loving, more sustainable and regenerative. And a lot less crazy. Want to get involved? There’s a place for YOU at Hart’s Mill Ecovillage. Contact us and be a part of it–NOW!